Below is a client story detailing how lives have been impacted by the work of legal service attorneys at Statewide Legal Services of Connecticut. 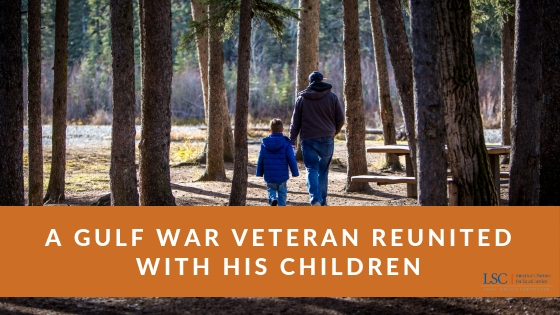 Mr. Harrison,* a Gulf War Veteran, had not seen his children in two years and was feeling very depressed and helpless about the situation. Following an acrimonious divorce in which Mr. Harrison was not represented by an attorney, he had not been allowed visitation rights with his son and daughter despite the lack of any allegations of abuse. Mr. Harrison contacted Statewide Legal Services of Connecticut seeking assistance to gain visitation rights with his children. A pro bono attorney was able to modify the original custody and visitation provisions, and made sure the new terms were feasible and enforceable. Mr. Harrison was soon reunited with his children, who were excited to know he hadn't abandoned them. He now has weekly outings and overnight visits with his children. His mental outlook on life in general has greatly improved.